A visit to this adorable bakery is sure to make your day. 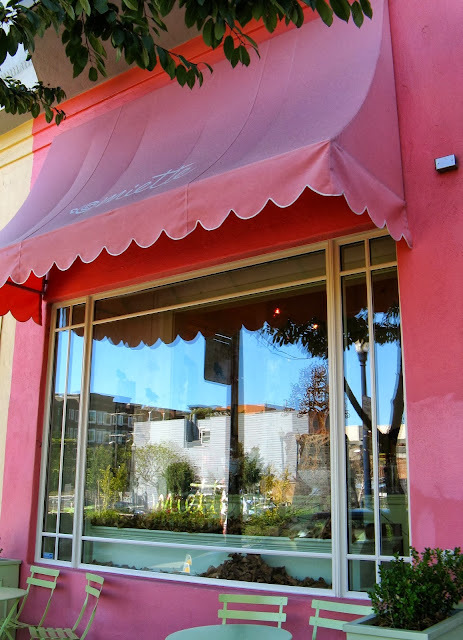 As soon as you arrive at the address, you're charmed by the pastel-pink storefront and inviting French café tables. The cute factor only increases as you walk in the front door. In the special universe of San Francisco boutique bakeries, Miette shines brightly amidst the stars. So sweet and charming, Miette is the definition of nostalgia. The vintage-inspired shop is a welcome escape from the real world. Miette's enticing interior filled with irresistible sweet treats! Miette's fanciful interior features pastel decor and floral wallpaper, as well as floor-to-ceiling shelving filled with glass candy jars. Childhood dreams are made of these treats. Everything you could ever want is here: old-fashioned toffee, buttery caramels, chocolate-chip cookies and cheerfully frosted cakes. You may have once sampled such delights or just wished that you did. What matters is that you are here right now to enjoy it all today! Miette takes its name from the French word for "crumb" and my interpretation is that you will savor every single morsel. All the cakes, cookies, tarts and candies are made of the freshest, finest and mostly organic ingredients from small local farms and mills. Begin your tasting adventure with several different macaroons, there are so many delicious choices: caramel, chocolate lavender, hazelnut, pistachio, raspberry, rose geranium, vanilla. I'm also smitten by the enticingly presented "Tomboy" layer cakes that look lovingly homemade. Be sure to try one of the cupcakes. My favorite (pictured above) is the vanilla cupcake with strawberry buttercream, which is pure fruity, creamy wonderfulness. Vanilla Tomboy Cake! Looks so yummy!!! chocolate ganache infused with aromatic orange zest). Miette "happy hour" on macaroons ($1 each) from 5pm to 7pm every day! That vanilla tomboy cake is my favorite! Love Miette. Wow! I am drooling over the Meringue Rosettes & Vanilla Cupcake and both cakes. What a wonderful little shop and how fun to know about the meaning of the word Miette! I will absolutely stop here on my next trip to SF. Yum! !